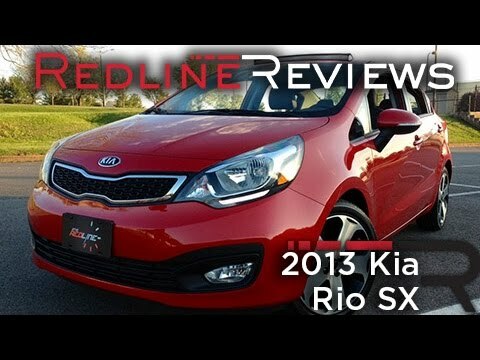 With the 2013 Rio and Rio 5 hatchback, Kia continues to prove that small and inexpensive doesn't have to mean bare bones and boring. The smartly styled subcompact Rio definitely has attitude, but its fuel-efficient engine and tech savvy interior is what will probably attract most buyers. Pros and cons of a little Kia rio. I have a 2013 silver Kia rio. I love this car, it is very suitable for people who are always on the go. The car is very small which makes it easier to park, and in my opinion easier to drive. There is 5 seats in the car, two in the front and three in the back. The back three seats fold down to expand the trunk size. The only problem with this car is trunk size. It is unable to carry large luggage, or anything large for that matter. I enjoy driving this car because it is small like me. At a whopping 5 feet, I can get into and out of this car with ease. It is a very reliable car, I have never had major problems with it. I have had this car for about three and a half years, and the worst problem I have had was having to recharge the air conditioning. Overall, people should by this car or a newer year of this car. The Kia riot, good basic transportation. The Kia riot for me, allowed me to buy a new car because of the price. While more basic than other 2013 models, my car has been very dependable. Pretty much just doing routine maintenance. My car did have a recall, which was promptly repaired. A sensor also went bad but it was covered under my warranty. . It is not fancy but it does get the job done. I am looking forward to keeping it for many more years to come. The only thing I did not like about the Kia riot is that it did not come with a spare tire. It has the repair kit which is not always useful depending on what caused your tire to go flat. I personally like the ecosystem. . It helps to save gas. I have had my Kia Rio for over a year now and I really love the car. It is really good on gas and has great features. It has Sirius satellite radio which gave me a free month when I 1st purchased the car. It is a 4 door sedan for easy access. It also has an ecosystem which is helpful for saving gas when going on long distances. . . Like riding the interstate for awhile or going on a long trip. It has also a very spacious trunk as well. I feel like the gas cap has to be fully on and twisted right. . . If it is not it might trigger the check engine light, but so far the car is great.